PLP Construction Limited is a family run business established in 1982 by Philip Bradley, Managing Director. The Company is built on a foundation of strong family values of honesty and openness which is reflected in the high level of repeat business we have from our Clients. We have a broad range of experience delivering both refurbishment and new build projects for Local Authorities, Housing Associations, Schools and Private Clients throughout the North West. We also build individual luxury developments. All of our projects are primarily undertaken by our direct locally employed team which enables us to achieve high levels of quality by empowering them to implement a ‘Right First Time’ approach on all our projects which significantly reduces defects, waste and duplication. PLP Construction is a local family business established three decades ago by Phil Bradley, Managing Director. The senior management team now includes his son, Laurie Bradley and daughter, Joanne James who are committed to sustaining and strengthening PLP Construction for future generations. PLP Construction is a lean and efficient business with hands on senior management team that ensures a very personal and customer focused service. Being a company with strong family values of honesty, openness and mutual respect and a team of locally based employees, we treat everyone the way we liked to be treated ourselves. This is reflected in fact that the majority of our employees have worked with us in excess of five years. We also have a locally based supply chain that has been working with us for many years. By working with the same supply chain we have created an Integrated Team Spirit that has a culture of challenging respectively each others products and services for the overall benefit of our Clients. As part of PLP’s Community Engagement Process we actively promote social inclusion and attempt to involve all groups in the wider community who may be impacted by a project. We have sponsored local events, local sporting teams and donated to local charities. Wherever we have worked in or close to schools, we have provided talks on health and safety and careers in construction. PLP are members of the Rochdale Hospice Business Buddies Scheme and are proud to support them. “Recently we had a visit from Joanne the Builder from PLP Construction in Rochdale, who works in our local community. Joanne talked to the children about all the people who help us to build a house: the Architects, Surveyors, Groundworkers, Builders, Roofers, Plumbers, Electricians and Plasterers. Sharon Harrison, Nursery Teacher, St. John’s C of E Primary School, Longsight. The children at Redwood School were keen to practice their interview techniques in preparation for leaving school and to help them to find work. Joanne James attended and the children showed her their specially prepared files of work and chatted about their aspirations for the future. “It was a very rewarding experience”. 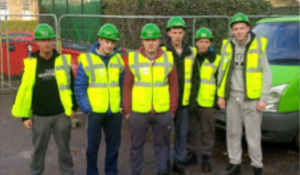 Wigan Skills Centre Level 1 Joinery students came to visit site to have a look at the project and gain some understanding of a working construction site. 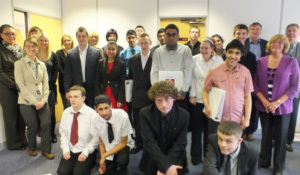 Wigan Youth Zone Employability Course – talking to students to raise awareness of the construction industry, talked to the students about careers in construction for both males and females – on site and office based. Took the students on site to meet the Site Supervisor and look at the new extension and the various construction roles currently working on site. Careers event for Primary School children – Years 4, 5 and 6. Joanne James attended to talk to pupils regarding career opportunities in construction. Joanne , thank you so much for giving up your time to visit our school. This is the first time that we have held an event like this and I wasn’t sure how appropriate it would be for primary aged pupils. Your thoughtful contribution helped to make it a success. I thought it was fantastic that you represent women in a male dominated career, and I know that you made some of our girls take notice! l All pupils and staff commented positively on the experience and we are now planning where we go from here. The children are now realising that there are job opportunities that they hadn’t thought of and they are aware that their actions/behaviours now can impact on later life. “Many thanks for supporting the Year 10 Mock Interview Day at Holy Family. I have just been reading through the evaluations which are very positive. According to staff in school the students apparently returned to their classes ‘buzzing’, for many it gave them a big boost to their confidence. The work that has been done today will be built on in face to face career interviews. I look forward to meeting you all again, Wendy”. 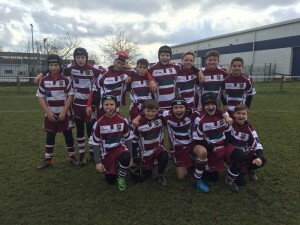 PLP were delighted to announce their sponsorship of Rochdale Rugby Union Club and wish them the best of luck for the season. The children from Year 5 and 6 at St Joseph’s Primary School in Heywood were keen to see how maths was used in everyday working life. The children visited out housing site close to their school at Argyle Street in Heywood. After their visit they looked at some of the site plans and then designed their own scale drawings and 3D models of the housing development. They then did some calculations to look at how much it costs to build a new house. They also designed some health and safety posters for us to use on our sites and looked at the various careers in construction that they could do when they are older. To showcase the children’s excellent work, the school set up a Gallery in school for parents to attend and PLP provided prizes for the top three designs. Withinfield’s Primary School was close to our New Street Housing Site in Southowram. 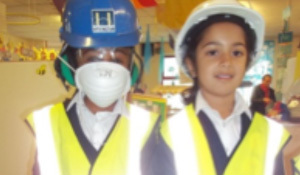 Joanne went into school to meet the reception children who enjoyed dressing up in PPE and talking about how Builders help them. We then talked to Year 5 and Year 6 children about all the various careers available in construction. 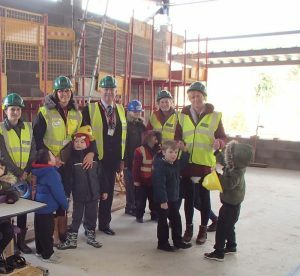 Afterwards the children walked to New Street and visited our site where the learnt about Insulated Concrete Formwork and how it is used to construct new houses, they also met the Site Manager and asked him a lot of questions about his job! All the work is first class, better thank I could have hoped for, I have never been involved with new build before and was unsure what to expect but it was made very easy with the help on PLP. PLP’s attitude and quality of delivery are first class. PLP are a positive example of how SME’s can sustain themselves in a competitive marketplace. Much of the success of this project was down to the good relationships both off site but especially with the Site Manager. We are looking forward to the value added opportunities that PLP are offering to the school and hopefully a long term relationship from then on.